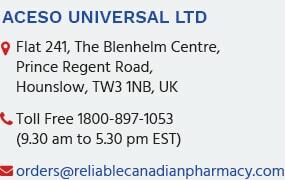 The products mentioned are trademarks of their respective owners and are not owned by or affiliated with Reliable Canadian Pharmacy or any of its associated companies. Information provided on this website is for general purposes only. It is not intended to take place of advice from your practitioner. It is for the knowledge of the site visitors at large that the brand names mentioned under Search column or under different categories, are meant merely as a guide. It should not be construed or misunderstood that the site has any remotest intention to market the 'Similar in composition to' Brand named drug or that the site has any tie-up or link with the manufacturers or traders of the 'Similar in composition to' named medicine . The site is provided on an "as is", "as available" basis and we specifically disclaim warranties of any kind, either expressed or implied, including but not limited to warranties of title or implied warranties of merchantability or fitness for a particular purpose. no oral advice or written information given by us nor our affiliates, nor any of our officers, directors, employees, agents, providers, merchants, sponsors, licensors, or the like, shall create a warranty. That medicine supplied are for personal use, not for commercial exportation or importation by mail and is not for a re-sale. You are purchasing it because it is unavailable in your country. Reliable Canadian Pharmacy is not liable for any customs and legal implications including forfeiture, seizure and / or auction. Any such legal implication or notice shall be forwarded to the purchaser. Further the web-site does not intend to use the trade-mark of the 'Similar in composition to' drug because the web-site is not selling any 'Similar in composition to' drug to its prospective customers and it is only sharing the existing knowledge and information which is already public and this has no relation whatsoever to the trade mark being used by the 'Similar in composition to' drug. It is also to be noted that the words 'Our Brand' refers to the brand which will be supplied by us. We may supply any other brand of a reputed company in case the brand under 'Our Brand' is not available. It should be noted that by mentioning the brand names anywhere on this site, we are not making a claim on any patent / trade-mark which the respective manufacturer / patent-holder might be holding.